Amatrol’s Mechanical Drives 2 Learning System (97-ME2) covers the construction, operation, installation, and alignment of heavy-duty V-belt drives, synchronous belt drives, and heavy-duty chain drives. This system also delves into topics associated with the maintenance and proper operation of these drives, such as belt and chain selection, lubrication, couplings, and drive troubleshooting. The drive systems featured in this mechanical drives training system are utilized in countless automotive, agricultural, industrial, and commercial applications, so the advanced manufacturing career fields for learners using these skills are vast. This mechanical drives training expansion system requires the Mechanical Drives 1 Learning System (970-ME1), viscometer, and a computer. This mechanical drives training system consists of a coupling/sprocket package, belt drive components package, power transmission belt and chain package, a grease gun, various indicators, and a fastener kit. Learners will use these real-world components to practice hands-on skills, such as installing and aligning a backside V-belt idler, troubleshooting a V-belt drive system, using a grease gun to lubricate a pillow block bearing, and installing and aligning a silent chain drive system. Amatrol uses components that learners work with in real-world environments in order to facilitate the strongest competency skill building and to supply heavy-duty components that stand up to frequent training use. The Mechanical Drives 2 training system includes a collection on packages featuring various real-world components for constructing heavy-duty V-belt drives, synchronous belt drives, and heavy-duty chain drives. These components are kept in part storage trays that are stored beneath the frame of the Mechanical Drives 1 Learning System (970-ME1). Components include industrial-grade bushings, sheaves, couplings, belts, sprockets, chains, and more! 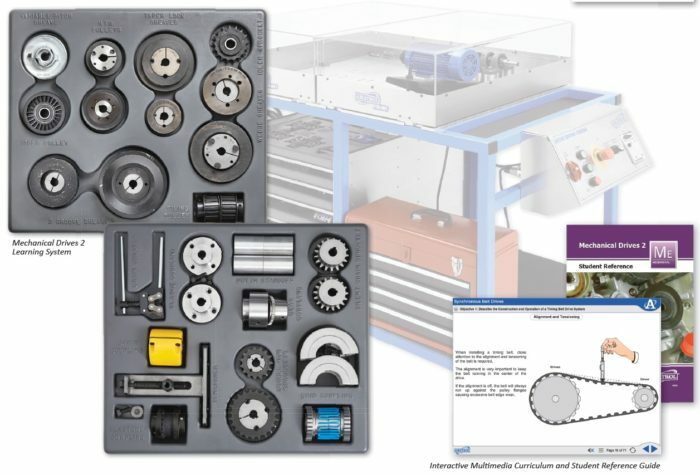 Learners will use these components to complete skills like measuring to determine correct belt size and type, installing and aligning a high torque drive belt drive system, aligning a coupling using the rim and face indicator method, and selecting a chain and sprocket for a given application. Amatrol’s Mechanical Drives training curriculum covers a range of topics including the construction and operation of a wedge V-belt drive, the function and operation of V-belt match codes, how timing belts and pulleys are specified, how to measure viscosity, the effect of indicator sag on alignment, how to troubleshoot a coupling system, and maintenance steps for a chain drive. This mechanical drives training curriculum is presented in a stunning interactive multimedia format that integrates various types of learning methods to create an astoundingly engaging learning experience. Amatrol’s multimedia includes text with voiceovers, video, 3D animations, pictures, and interactive activities, quizzes, and self-reviews. In addition to Mechanical Drives 2, the 970-ME1 can be expanded to train learners on bearings, seals, and gaskets (97-ME3), as well as clutches, brakes, and flywheels (97-ME4). Further, you can also add systems for Roller Pack Machine Tool Axis (97-ME4-A), Floor-Standing Belt Conveyor (97-ME4-D), and Machine Tool Chip Conveyor (97-ME4-E). A sample copy of the Mechanical Drives 2 Student Reference Guide is included with the learning system. Sourced from the curriculum, the Student Reference Guide takes the entire series’ technical content contained in the learning objectives and combines them into one perfectly-bound book. If you would like to inquire about purchasing additional Student Reference Guides for your program, contact your local Amatrol Representative for more information. Components include industrial-grade bushings, sheaves, couplings, belts, sprockets, chains, etc.